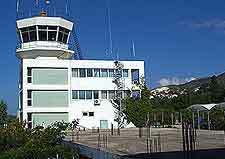 Located 8 km / 5 miles south of Argostoli, Kefalonia Island National Airport (EFL) stands between Lassi and Minies. The airport is within minutes of several cities on Kefalonia. However, some resorts are located up to 48 km / 30 miles away, while Argostoli lies a mere 8 km / 5 miles to the north. Although Kefalonia is the largest of the Ionian Islands, it is still easy to reach almost any town or beach by car. Popular destinations on the island of Kefalonia include Katelios, Mounda, Ratzakli and Skala, all of which lie around the southeastern coast. Slightly north, Poros is a particularly charming town and features a busy port and several tavernas serving traditional Greek cuisine. There are four car hire agencies located at Kefalonia Island International Airport. As with the whole of Greece, be sure to stay on the right when driving around Kefalonia. Be especially careful along the roads, which can be come narrow at times, and particularly bendy and winding, even featuring gravel stretches along some parts. Mountain roads are often extremely scenic, although some are only suitable for 4WD jeeps or similar vehicles, which are available for hire around the island and at the airport. Traffic signs in Kefalonia tend to use fairly universal symbols and are written in both Greek and English. Whilst parking is allowed along many streets in the towns and resorts, available spaces can be hard to find in the most convenient locations. Book your Kefalonia Car Rental here.